One expects a debate about Pope Francis’ new encyclical to form around the details of climate science, or the efficacy of carbon credits, or the theological merits of ecology. But a stranger, subtler difference of opinion has emerged, one that I suspect has more political consequence than it lets on: the interpretation of mood. The New York Times and The Washington Post have published thought-provoking, if somewhat mystifying, essays that consider the pope’s tenor to be a dour one. The authors, Ross Douthat and Matthew Schmitz—both with ties to the journal First Things, for whatever that’s worth—stand in contrast with the responses of many of their fellow Catholics to “Laudato Si’,” which have tended to be either evasive or celebratory. They engage, but without much rejoicing. Douthat refers to the encyclical as “sprawling” and “apocalyptic,” bearing the message that “current arrangements are foredoomed” in the absence of cataclysmic revolution. Schmitz holds that “Pope Francis wants to roll back progress,” and that the encyclical “is the work of a profoundly pessimistic man” intent on “opposing modernism—that old antagonist of the Church.” He speaks of its “forboding” and likens it to Pope Gregory XVI’s anathematizing of railroads. Both writers have something nice to say about the questions that the document raises, but they meanwhile give readers sympathetic to modern economic and technological progress a handful of reasons, either stated or implied, to be less than enthusiastic about the pope’s call to action for climate justice. “Critics,” writes Schmitz of the pope, “will seize on his dark tone, but Francis’ letter offers a challenge worthy of serious consideration.” Does his own seizing on the document’s darker passages make him primarily a critic, too? This is not clear. After all, Schmitz recommends “serious consideration.” Such affirmations, while eloquent, strike this reader as a little dutiful, possibly even Straussian—an expression of loyalty that meanwhile does the work of opposition. I suppose these things are in the eye of the beholder. But I read the mood of the encyclical quite differently. Its title translates as “praise be to you,” quoting a prayer that revels in the glory of God’s creation. It ends with those words as well. It extols the relationships among human beings and our bond with the universe God has made. It describes good progress being made around the world, by Catholics and non-Catholics alike. It proposes an “integral ecology” that honors divine creation through human flourishing. It talks a lot about love and harmony. At its center is the incarnate Christ, resurrected in our midst. The encyclical surely sounds an alarm about environmental sin; I don’t think anyone can deny that human beings have sorely neglected our calling to stewardship. Yet many of the recommendations are both familiar and already underway, like global regulatory institutions and renewable sources of energy. Rather than the “catastrophist” revolution Douthat detects, Pope Francis describes his primary ambition as being for “dialogue” among various sectors of society. The most drastic longings—for an economy not centered on profit, for a conversion away from materialism—are classic Catholic social teaching. Yes, this is radical in comparison with our present global order, but it shouldn’t come as a surprise. He calls for a multi-leveled conversion that takes many different forms in many different contexts, according to the principle of subsidiarity. “Truly, much can be done!” Francis exclaims at one moment of enthusiasm. When I first began reading the final text on Thursday morning, I wept. There was lamentation in that, and repentance. But mostly those were tears of consolation and of hope. What accounts for this difference of perception? I can’t claim to know for sure. And there’s at least some degree of confirmation bias at work. I have felt implicated in the violence of environmental destruction since grade school; in the years since I’ve come to see an economic system built around short-term corporate profits as its principal engine, and the poor as its principal victims. The encyclical appears to baptize my long-held beliefs, and admittedly there is some pleasure to be had in that. But there is also humility in this for me. The pope’s option for the world’s poor means that the wisdom of poverty must be at the center of our dialogue, correcting whatever received ideologies stand in the way. Hope can be aided by glimpses. I spend a lot of my time working among social movements involved in resistance and alternative-building, so I see the seeds of possibility—stuff Pope Francis mentions like cooperatives and localized economies—in the present, not in some far-off distopian future. They exhibit the promise of enterprise and innovation without the grabbier qualities of capitalism; they remind me that we can manage resources as commons, not relying so much on corruptible governments, or unaccountable markets, or the largesse of the rich. Because I like to experiment with community-based technology, I can accept the pope’s critique of consumerist devices without worrying that it might take us back to the Stone Age. I don’t claim, and I don’t think Francis claims, to know all the answers about what we’re to do. I also claim no special knowledge or insight into the workings of his mind. But we do need an honest dialogue. To me the dialogue he proposes is thrilling, not depressing, and it’s not especially apocalyptic to say that such a dialogue is long overdue. We need the dialogue to include hard questions, such as some of those that Schmitz and Douthat raise, so I hope they’re serious about continuing to engage in it. I don’t see in this the prayer of a pessimistic man, and it eludes me to grasp how anyone would. I read both as throwing some water on the notion that Laudato Si can be reduced to an activist's checklist of actions, or a 10-step blueprint to save the planet (certainly he proposes solutions). Indeed, Pope Francis himself rejects "solutionism" in the encyclical. Further, saying he questions the foundations of the "modern" global age is not the same as saying he is pessimistic, at least to my reading. I read Piketty, for example, as a fundamental indictment of the global financial machine; yet I don't come away thinking he is "pessimistic." The pope’s assuming of the apocalyptic tone of the environmentalist is, in the end, ironic. It is the Church’s gospel that offers us the true Apocalypse, which is a hopeful revelation of God’s coming and cause for joy among the good. Laudato Si, by contrast, is perhaps the least hopeful, most joyless document to come out of the Vatican in my lifetime. Indeed. It's also worth noting First Things editor R. R. Reno's own essay, which bears remarkable resonance with those of Schmitz and Douthat. It is striking how much the disagreement is right now over how to read the encyclical rather than contesting the content. Perhaps mood is safer territory for Catholics who don't want to find themselves in outright opposition to the pope. I guess I just fundamentally disagree that this what Douthat & Schmitz are, in fact, doing (probably because I suppose my own sympathies lie close to their own). But I find them highlighting the notes of the "score" that probably closely resonate with a "conservative" ear. In other words, their reading hits on those aspects of the text one would expect to appeal to a certain kind of conservative, i.e. those parts that do read as a kind of "lament" for a loss form of life/connectedness to nature that we likely cannot recover, no matter what particular policy proscriptions are adopted (I'm thinking, for example, of Rod Dreher's "crunchy con" view). If this is what they are, in fact, doing, then contra being in opposition, they are in fact affirming the text/score, albeit as they "hear" it. Theirs is a different reading from those "conservatives" asserting Pope Francis is in over his head, or wrong on the science, or should stay out of economics. I see no opposition at all in either Douthat or Schmitz. I also disagree that Reno's essay bears "remarkable resonance" with either Douthat or Schmitz. Finally, it seems to me that discussions on "how" to read the text are important itself, & that if one allows various interpretations of it, then one has to, in good faith, allow persons to provide their reactions to it on their own ground without ascribing motive. Pope Francis is a scientist, a theologian, a great shepherd, and a brilliant thinker. And a mystic, and wise. For proof of his ability to see deeply to the bottom of complex social systems, read his essay entitled “Corruption and Sin” in the volume “The Way of Humility”, published by Ignatius Press. In this clear and deep essay, Pope Francis analyzes how evil affects the operation of the social order. It’s amazingly insightful. And although the topic is difficult, the Pontiff is brimming with truth, hope, and strength. Then, in “The Joy of the Gospel,” the leader of the Catholic Church is on fire with the joy of the Word, and gives us some mystic clues towards the end of the encyclical. 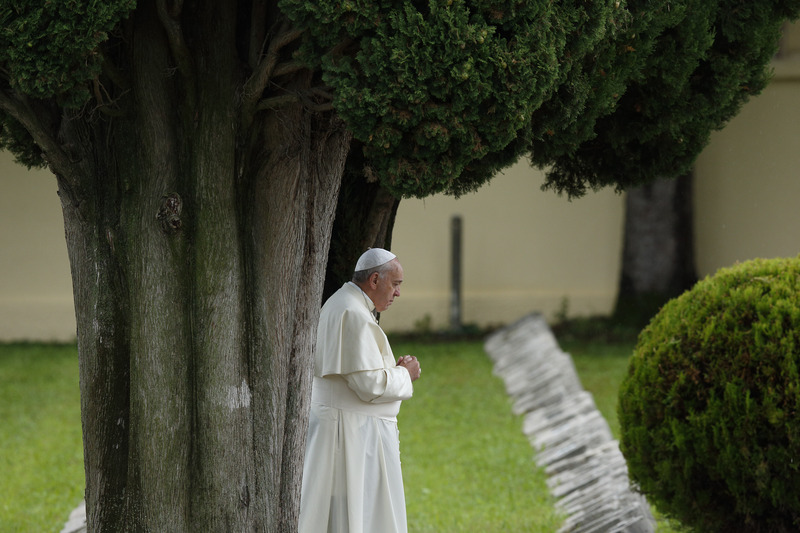 Then, in “Laudato Si’,” our Pope again, necessarily, tackles a difficult issue—the degradation of the environment. But he brilliantly makes this an opportunity to teach humanity the way to a bright future, one in which we are in a much deeper relationship with the Earth and Creation. More Good News. And at the press conference last week accompanying the release of the encyclical, Cardinal Turkson, together with Metropolitan of Pergamon John Zizioulas—an Orthodox bishop!—were at center stage. Together. A hugely positive ecumenical sign of hope, love, and progress. Enter Mr. Schmitz’ op-ed piece in the Washington Post, the title of which screams, falsely, that the Pope wants to “roll back progress”. In the first sentence he falsely calls the Pope “a profoundly pessimistic man.” It goes downhill from there. Who does Mr. Schmitz think he is to so casually cast false insults at the leader of the Catholic Church? In a national newspaper?! Oh, in the above piece in America, he ludicrously calls the Pope “Charlie Hebdo.” Who does Mr. Schmitz work for? This is nonsense, J Cosgrove. Laudato Si' is very joyful, and shows the way to a deeper relationship between humanity and the Earth. And with all Creation. Which is a very Christian and joyful message. J Cosgrove doesn't seem interested in alternative viewpoints. To mention only one reason why attempting debate with him/her is a waste of time. What a silly comment. No one hear knows what I believe and think about the encyclical. I am very vocal on what causes poverty and how to correct it. My initial comment here was on the absurd comments by the author which are then reflexively criticized and not refuted. J Cosgrove, under the current iteration of capitalism, the divide between the wealthy and the poor is growing. And unfettered greed of Wall Street capitalists led to the global financial meltdown of 2008, which we are still recovering from, and which devastated the poor yet again. So what's so great about capitalism, as you understand it? And, regarding poverty, it seems that the Catholic Church and Pope Francis understand it much better than you do. Absolutely—and great reminder about "solutionism"; that's something Schmitz rightly highlights. There is going to be a tremendous enthusiasm for treating the encyclical as a policy brief, which it is not. But saying that doesn't require throwing water on the Holy Father's spirit of hope, does it? and the poor as its principal victims. Absolute rubbish. Why does America allow such nonsense to be printed? It is the opinions of such authors that keep people in poverty and take those who have risen out of it and put them right back in it. The Pope's encyclical is bad science, bad economics, and bad social policy. It should be buried quickly unless we want to create more poverty. I'm not sure that the outsized impact of climate change on the poor is really controversial. It's a recognition stressed, for instance, by the OECD and the United Nations. And it stands to reason; those with more resources would be able to use them to adapt to changes more easily. Could you offer some specific evidence to the contrary, rather than a blanket dismissal and accusation? The evidence is overwhelming that free market capitalism has lifted the majority of the world's poor out of poverty. It has created longer lives, healthier people, highly educated populaces, more freedom to do what one wants to do. It even allows you to make your nonsense rants. It is where it is not practiced that poverty and oppression is still rampant. Please document how climate change if it actually exists has harmed the poor. I have not seen it. Nor does Pope Francis document it. And by the way, cooperatives and localized economies if they are conducted freely and legally are part of free market capiatlism. The essential part of free market capitalism is "free" where both parties to a transaction enter it freely. My guess is that you haven't a clue what free market capitalism is about. "It even allows you to make your nonsense rants." Come now. You greatly decrease your own credibility with such comments. An " I have not seen it" seems a bit naive and privileged. Suppose that has SOMETHING to do with where YOU live? And, "My guess is that you haven't a clue what free market capitalism is about." is yet another rude "rant" of your own that again decreases your credibility. In fact, Nathan's thoughts here indicate to me that he is much more attuned to "what free-market capitalism is about", and that critiques of "grabbier aspects" indicates to me a realization about the seedier side that you seem to want to push under the rug in service to your devotion to the mythical dimensions of the ideology of 'free-market' capitalism (emphasis on 'free' as in 'no matter the consequences'). "It even allows you to make your nonsense rants." Come now. You greatly decrease your own credibility with such comments. Thank you for replying. Mr. Schneider is the one who said that capitalism victimizes the poor, a statement so at odds with reality that yes, it can only be classified as an ill informed or a nonsense rant. "My guess is that you haven't a clue what free market capitalism is about." is yet another rude "rant" of your own that again decreases your credibility. In fact, Nathan's thoughts here indicate to me that he is much more attuned to "what free-market capitalism is about"
Mr. Schneider has put forth socialist principles since he first appeared here about a year ago. Socialism has failed miserably as an economic system and has caused more poverty than any other economic system tried so it doesn't seem that he has an understanding of economics or he wouldn't be pushing such dysfunctional ideas. You fail to understand free market capitalism since in it both members of a transaction enter into it freely. I have no ideas what is meant by "no matter the consequences" since in a free market transaction both parties expect a desire outcome. That does not mean it is always exactly what one expects but it is freely contracted. I will make the same suggestion to you that I made to another commenter. Capitalism comes in many forms. And most people do not understand it. If you read and listen to Jerry Muller of Catholic University on capitalism. He has written a book and produced a comprehensive presentation on capitalism for the Great Courses. He covers its history, its variations and its pro and cons. Each complements the other. When you have done so maybe your reaction will be different. http://www.amazon.com/The-Mind-Market-Capitalism-Western/dp/0385721668 http://www.thegreatcourses.com/courses/thinking-about-capitalism.html Both should be available from local libraries. Enjoy! And as I said in reply to Mr. Schneider, cooperatives and other such organizations are examples of the free market as long as they do not restrict what others can do or how other cooperatives can compete with them. Then they are not free. The pope is on the side of science. He does not condemn capitalism. The excesses are what he targets. Indisputable that the destruction of the environment hurts poor people more. China and the US ae the worst offenders. $7.00 an hour is not right. Capitalism has to be regulated. Those who decry regulation are all over the government to investigate those who are hurting them business wise. This is a great encyclical. He gets at the essence of the message of Jesus to help the downtrodden and free the captives. Jeb Bush is the biggest hypocrite. He says the pope should stay out of politics while he is courting the Evangelicals who are mired in politics. Capitalism…is that the economic system where it’s possible to become a billionaire tax free? Perhaps it’s an economic system based on Sam Walton’s DNA. Did four of the top ten US billionaires ever earn a dime, have they ever worked a day in their life? What was the tax on their billion dollar inheritances? Zero. In the US, “…healthier people, highly educated populaces, more freedom…” accurately depicts Democrat dominant states. The opposite is true in Republican dominant states. Life expectancy in Libya on average runs a year longer than in Republican dominant states. Recent statistics show life expectancy for white Americans has decreased, the first time in the nation’s history. Blacks in Democrat dominant states are 40% more likely to have a bachelors, graduate or professional degree than Blacks in Republican dominant states. Oxfam’s 2015 report showed that the world’s bottom 80 percent own just 5.5 percent of its wealth. At current trends, 1 percent of the world’s population will possess more wealth than the other 99 percent by 2016. Perhaps you can share how 99% of the planet will have “…healthier people, highly educated populaces, more freedom…” after 1% “inherits” the planet. For the record, however, I'm also inclined to think that short-term corporate profits as the basis of an economic system also harms the poor. But that's a more complicated discussion, and I'm not assuming it here. Excellent point, Mr. Dunn! In Evangelii Gaudium, Pope Francis recommends economic systems that help people. All people. What an amazing idea! Yes, and while Pope Francis criticized much about the economy and business, he points out, "Business is a vocation, and a noble vocation, provided that those engaged in it see themselves challenged by a greater meaning in life; this will enable them truly to serve the common good by striving to increase the goods of this world and to make them more accessible to all." (No. 203). Businesses, and the economy, rest on multiple legs, the most basic of which is providing goods and services to customers who have access to multiple offerings in a competitive marketplace. Without that, the business quickly dies; the business (or economy) that uses short term profit as its basis is inherently unstable, (like the one-legged stool) short-lived, and thus rare. Engaging workers in meaningful employment, earning profits as a return on capital, developing new knowledge, using resources carefully, etc., are other legs of the stool. When all these interests are acknowledged, the business and the economy thrive, to the benefit of all. Yes, it's amazing. The business of business is profit. The business of government is people. Mr. Kotlarz, Pithy, but in “Laudato Si” Pope Francis clearly sees the role of business as more complex. He restates his Evangelii Gaudium comment (No. 203) which acknowledged business as providing goods and services(see above). “Business is a noble vocation, directed to producing wealth and improving our world. It can be a fruitful source of prosperity for the areas in which it operates, especially if it sees the creation of jobs as an essential part of its service to the common good.” (Laudato, 129). So, Francis speaks of at least three legs to the stool of a proper business: the provision of goods and services, producing wealth (which may be intellectual or social capital, as well as financial), and providing employment. Balancing those and other elements of business is the everyday work of managers and executives, and most try very hard to get the balance right. Francis offers plenty of criticisms of business, and the economy, and government, and individual behaviors (especially consumerism). We need to acknowledge all of them, whether already known to us or something that we had not seen before. Are their businesses that focus only on short-term profits? Yes. They are as unstable, short-lived, and therefore about as rare as one-legged stools. Peace. Capitalism has always been around. Christ refers to it in the parable of the Talents and praises the servants who were the most aggressive with their master's investment. But capitalism, a word coined by socialists, only became an integral part of how a society works early in the 19th century when the Industrial Revolution spread from Britain and Holland to the US and the rest of Europe. To illustrate this see the following video: https://www.youtube.com/watch?v=jbkSRLYSojo Again I will repeat for those interested, read/watch Jerry Muller of Catholic University on capitalism. He has written a book and produced a comprehensive presentation on capitalism for the Great Courses. He covers its history, its variations and its pro and cons. Each format complements the other. When you have done so maybe all can understand that it is capitalism in some of its forms that has made the modern world. If one is going to criticize capitalism, one should understand just what it is and the effects it has had. There is no better way to distribute goods then through free market capitalism, one form of capitalism. Does it have some negative outcomes? Yes, but they are generally not economic. Here are the links: http://www.amazon.com/The-Mind-Market-Capitalism-Western/dp/0385721668 http://www.thegreatcourses.com/courses/thinking-about-capitalism.html Both should be available from local libraries. And for those who think that the world is worst off, there are hundreds of articles that refute this. Here is one from an ultra conservative site: http://thinkprogress.org/security/2013/12/11/3036671/2013-certainly-year… By the way if this gets posted it is because the original comment was removed because I was editing it It did not like me changing the comment which was to improve the grammar. The irony is there are numerous modern examples of Marxist socialism being recently abandoned by all the nations of the former Soviet Union and its satellite countries and largely abandoned by China in favor of capitalism. China in particular has made enormous economic progress and has become the second largest economy in the world in less than 40 years since Mao died and Mao's "Cultural Revolution" ended in favor of capitalism and foreign trade. Incredibly the encyclical actually calls for a another "cultural revolution" when Mao's Cultural Revolution of the 1970s was an political, economic and social disaster which China does not want to repeat and neither should other nations. All the nations of the former Soviet Union such as Russia and its satellites such as Poland and the Ukraine have also made huge economic advances since the Soviet Marxist socialism system collapsed 25 years ago. Left undeveloped and extremely improvised are nations like Cuba and North Korea even after more than 50 years under Marxist socialism. After the collapse of the Soviet Union many third world countries India and Brazil privatized much of their economy to allow more private control, investment and growth in their economy. Both India and Brazil economies grew with more private capitalism and less government control of the economy. Why is it that the huge and dramatic economic progress made by these all these countries made after turning to capitalism and which are expected to continue not be positively regarded. Yet the encyclical disregard these strong economic results from capitalism and instead encyclical views capitalism with very dark cynicism that is completely undeserved. I have to insist that the encyclical is yet another Galileo moment for the Church where the Church involves itself with science and comes up with the wrong conclusions based on theological reasoning that disregards scientific proofs or lack of proof. The Church did get Galileo's conclusions all wrong regarding the science of cosmology. Similarly today in the encyclical the Church gets involved with the science of climate and economics controversies and comes up with the wrong and sweepingly pessimistic conclusions. Of course as with any sciences insight and knowledge can always be endlessly improved on. But why should the Church back or even start controversies disputing the merits of capitalism when capitalism has demonstrated overtime and worldwide huge positive advantages? Why moralize that capitalism is bad when it is a demonstrated good? This is the same backward reasoning from the Church that Galileo faced. Empirical scientific studies such as cosmology, climate and economic are not compatible with deductive theology. The Church still does not adequately understand and respect scientific approaches and instead ignores demonstrated results based on proven science. The encyclical shows the Church continues to have Galileo type non-acceptance of scientific results of proven merit. Countries around the world including China and Russia perhaps adopted capitalism that works 85% of the time. Maybe capitalism that worked only 50% of the time is what fueled the earlier spread of Marxist socialism around the world. Of course if capitalism that works 85% of the time has less merit than capitalism that works 50% of the time, please explain. From 1856 through 1933, US capitalism literally spent as much time destroying wealth as it did creating wealth. Millions saw their lives ruined and lost everything including their homes and life savings during eighteen economic contractions. Unemployment typically ran 12% to 25% during recessions, panics and depressions. The New Deal, FDR’s version of the three legged stool, perhaps made the most dramatic progress toward the Pope’s vision. The US economy expanded 85% of the time after WWII compared to only 50% of the time prior to FDR’s New Deal. Capitalism of course immediately sought to weaken and ultimately eliminate the New Deal. Progressive federal income tax rates eroded from 94% in 1945 to a low of 28% in 1988. The top federal income tax rate was 25% the year of the 1929 Stock Market crash. Former Federal Reserve Chairman (1935 to 1948), Marriner Eccles, felt a system of taxation conducive to a more equitable distribution of income was essential to preventing economic depressions. Bank regulation, Glass-Steagall (1933-1999) is gone. The inevitable perhaps would follow Glass-Steagall’s repeal. “September and October of 2008 was the worst financial crisis in global history, including the Great Depression,” former Federal Reserve Chairman Ben Bernanke is quoted as saying. Of the 13 “most important financial institutions in the United States, 12 were at risk of failure within a period of a week or two.” Democrat dominant states clearly lead Republican dominant states in aligning with Pope Francis. Nowhere is this more evident than in a comparison of minority demographics. No US voting block perhaps better grasps Pope Francis' message than minority voters. Historically, capitalism’s harm is not limited to the poor, nor is the harm merely a short term profit anomaly. But, as suggested, it's a more complicated discussion, one not to be assumed here. "The Pope's encyclical is bad science, bad economics, and bad social policy" !!!! This is extremely pathetic for someone that has NO credibility whatsoever in the fields of sciences, economics, and sociology. This is the issue of Internet Blogging - anyone can dish out anything without any consequences. I don't know why you bother come here with your absolute nonsense comments. Please! Thank you for your kind words and insight. It a very good thing our dear brother J Cosgrove and everyone else lives in 21st century America and not the bad old days of 17th century Europe where the Inquisition would be called in to suppress thought, scholarship and free speech as happened with Galileo. Who can forget that even though Galileo science was completely correct, Galileo and his science were condemned? This is one of the biggest intellectual mistakes of all times ever made by a Pope whose very bad moral judgment will live forever in infamy. The servile response of people to anything the Pope says as was routinely given to feudal lords of the Middle Ages no matter how poor the Pope's remarks were is just not going to happen in 21st century America. The most important poverty the Pope most carefully needs to be concerned with is the intellectual poverty of message content that does not make sense and is not solidly reasoned and argued in a way the public can understand and support. The problem with the Pope's message is that we do live in a internet age which makes available numerous references for comparisons and have highly educated and discerning public such as J Cosgrove as an audience who will listen to and question and take measure of the meaning and implications of the Pope's messages. We just do not live in a feudal age anymore of massive illiterate populations where anything the Pope says will automatically, and totally have acceptance by the public audience. One must expect lots of questions and critiques of the Pope's numerous, sweeping and very public remarks. The Pope's remarks needs to be convincing and understandable to the public. The public audience needs to be respected. This is the 21st century. Tom, Thank you for the support. There is a lot of unsupported opinions flying around here along with a lot of ad hominems. However, I believe you will want to reconsider your comments on Galileo. He was the one at fault in the controversy, not Pope Urban. Urban suggested the title and content of Galileo's thesis but asked him only to put forth his ideas as an hypothesis. He didn't do that but put forth the Pope's request as the remarks of a simpleton in a document that had the seal of a man who was trying to depose Urban. It had to do with the politics of what became known as the 30 Years War. Which by the way is portrayed as a Catholic vs Protestant war but which fails to indicate that Catholic France was on one side while the Catholic Hapsburg were on the other. It is here where the Galileo affair is best understood not a conflict of science and religion. If you can get from the library a course from the Teaching Company called Science and Religion http://www.thegreatcourses.com/courses/science-and-religion.html There are two lectures on Galileo. The present day story of Galileo comes from 18th and 19th century Protestant attempts to disparage the Church and distorts what happened. Again thanks for the support. J Cosgrove, the "unsupported opinions sloshing around here" are your own. You are constantly stating false claims about Laudato Si'. And there is a lot of scientific data to support what the letter says. Don't you realize that scientists were involved in the writing of it? Why are you on a mission to discredit this beautiful gift that is Laudato Si'? Additionally, you are talking about ad hominems, while you make woefully wrong statements about the encyclical, and hide behind the "don't-ad-hominem-me" shield. I'm curious, J Cosgrove: who do you work for? Tom – your argument is extremely misleading. It seems as if the Pope just came up with his opinion out of nothing. Learning from the debacle of Galileo, this encyclical is the most scientifically conforming ever from the pontiff. The Vatican has been working with a group of prominent scientists over a period of time to prepare for this document. http://www.bloomberg.com/news/articles/2015-06-16/how-the-pope-got-religion-on-climate-change These scientists come from a very diversified background and “they are there for pure scientific excellence, and they are not co-opted by any country. They’re not co-opted by the United Nations” Over 97% of scientists agree with the reason for climate change. For such a prominent and important topic, 97% consensus is already extraordinary. Of course, it is very rare that scientists can agree 100%. Even today, some scientists are still trying to find some holes in Einstein’s relativity theory. Of course, we rarely hear about them because they are in such a tiny minority. Until they can find something meaningful to prove their theory, nobody is paying attention to them. Similarly, the climate change skeptics are in such a minority, even though they are sponsored by deep pocket sources such as big oil companies, big oil nations, and big conservative groups, nobody would pay any serious attention to them until they can produce something not based on “pseudoscience”. For the same token, can you have an honest and open debate on topics that the counter argument are so “pseudoscientific” such as: -	Are the earth and the universe billions of years old or only few thousand years old based on the Bible? -	Is life on earth today has evolved though billions of years or it is just appeared only a few thousand years ago based on the Bible? -	Are vaccinations really harmful and should be left as a choice? -	Is smoking creating lung cancer? I rest my case. I would not bring up evolution. You will get an even bigger consensus among scientists on how evolution happened when in fact no one knows how new species arose. They certainly did not arise through the ideas of Darwin nor the modifications to his ideas since he died. But the average scientist believes they did. As far as global warming, there are several questions. 1. Is there global warming? 2. If there is, how much? 3. What caused the warming? 4. Is the warming harmful? 5. Can the trend if it exist be modified by any man made action? None of the answers to these questions involve poverty in any way. Dealing with poverty is a completely independent issue. The encyclical is mainly about spiritual poverty. The discussion should separate this from any discussion on climate. J Cosgrove, what do you think could be the cause of global warming? Gee, do you think the hundreds of millions of combustion engines, industries and factories might have anything to do with it? Hello. There is already a lot of information available to answer your questions. By the way, the encyclical mentions the bizarre weather events that have happened in recent years. That's evidence that something is out of place. Or do you ascribe a different cause to them? And regarding poverty, I don't think you understood what Pope Francis wrote. He demonstrated very well that all things are connected. Poverty is not a separate issue from the degradation of the planet. These things are connected. The people who hurt the environment do not live by this truth. To their hurt and ours. I’m not sure about your questions regarding global warming. Do you want to have “an honest and open debate” about these questions or just for trolling? For me as well as for the scientists working at The Pontifical Academy of Sciences, these questions are mostly settled. Are they related to the issue of poverty? Yes in a profound way, both material and spiritual. How can it be solved? The encyclical does not prescribe a solution or a set of solutions and this fact is commented numerous times here on America as well as in other media. Finally, what are you and other conservative minds are so afraid of about this encyclical in order for you to have such a strong and negative reaction, to try desperately to falsely disprove and distort it? What is wrong if we try with our best capacity to use less natural resources, to produce less pollution, to make the world more livable for current and future generations, to look at the creation and see the glory of God in it? PS: About evolution, I only mentioned that this is a process that took a very long period of time, i.e. billions of years. I also believe that this process is guided by God’s mysterious providence in the way described by Teilhard de Chardin in “The Phenomenon of Man”. If a scientist truly thinks that the notions elucidated by Darwin through his research and hypothesis-testing were humankind's first and last attempts to discover descent and discuss evolution, that scientist is not embedded in history. I'm not sure the "average" scientist would think Darwin was the beginning of, and modifications the end of, the case. Mr. Booth, Darwin's ideas on evolution are the major driver of atheism is the Western World. And they are essentially false. Darwin's original ideas included gradual variation and natural selection as the driver of change in life forms over time. Over long periods this gradual variation supposedly produces new species through natural selection. At Darwin's time he had no idea what caused the variation and knew nothing about genes and mutations. This was added later to his basic ideas and has been called Neo Darwinism or just the modern synthesis. This synthesis is constantly updated as new findings are discovered. Darwin concluded with no basis in any data that all life descended from an original cell and called this conclusion, Common Descent. His ideas were immediately accepted by a large part of the intellectual and science community even though at the time there was no biological mechanism for how this happened. The problem is that these processes do not produce anything but trivial changes to various life forms and there is no evidence that they ever resulted in any major changes in species. But just about every biologist will attest that they do. No text book says we do not know how new species arrive. They all will state explicitly or imply that they happen by Darwin's ideas of variation and natural selection. So my point was that if the 97% is actually true for saying global warming is true (this number has been contested) there is no reason to believe that anyone saying that they believe it, has actual information to confirm this. The number for those who believe there is a naturalistic mechanism for evolution is equally large and entirely wrong. But people go around touting numbers that may have no basis in actual science. I am not saying that there has not been any changes in temperature but my questions above are an attempt to put all this in a series of questions that should be analyzed and not just accepted in a knee jerk fashion. There are people who accept global warming but say it is not a big deal. There are others who say there is no way to change it. There are others who say our money should be spent on other projects which would have a more direct benefit to poor countries. All these questions get squashed as there is no debate about the issues. It is all settled and we should all give money to someone. Somebody once said, follow the money and you will understand the debate. So watch where people want the money to go. J Cosgrove, There is a lot of direct evidence for global warming and climate change. Evolution, however, is a much more complex issue. I agree with you there. Darwin did discover some fascinating things. Yet his theories and observations have more to do with the forces in the natural world, and the "push from the past" that operates in a natural, uncaring way in history. (And, as you note, there are still many things that Darwin cannot account for just in this "solely natural" realm.) What Darwin does not address at all is the reality of a telos, a goal. Along with the brute "push from the past" that drives processes like natural selection and survival of the fittest, what if there is a "pull from the future" as well? This "pull from the future" could be related to the Holy Spirit, and to the Will of God. To God's Plan. This "pull from the future" could involve humanity's growth in love. Because we are intelligent and charitable, we may put down our fear, greed, and defensiveness that was limitedly useful in the past, and we may put on the mind of Christ, as Paul says. We can learn to live in love and concern for all of our sisters and brothers. Does this make sense? As you may know, science proceeds on the basis of heuristics (trial and error); hence, until something in the natural world becomes invariant, it is not a law and may be altered. This is science - not a flaw in science. Only scientific laws are seen as a kind of "finished work," as Darwin's work clearly is not since scientists learn more about our evolving processes all the time. Darwin's work has not caused atheism, since atheism is a lack of belief in the transcendent. Science is not transcendent. Few realize that Darwin studied to be an Anglican cleric and, while his wife was more religious than he, did not teach or preach that there is no God. He stayed with science and hoped that religion and science could be reconciled. One further comment would be that there is a major difference between science and faith. One believes or does not believe in that which is not seen; one knows about science. So, to say that some do not "believe" in, say, climate change, is a misstatement. For science to say something, empirical evidence is required; no such evidence is required in the world of faith. You fail to recognize the popular consensus of scientists are very likely wrong. Without rigorous scientific experimentation and testing that proves the details of climate change no new science -- knowledge -- is created that can then be relied on . The opinions of scientists are fluff. Scientist are all the times surprised by the results of actual testing and experimentation by the discovery of unknown and completely unsuspected factors and twists to natural process that no one suspected that are always radically changing our concepts of nature. Scientific discovery of how nature such as the process involved in climate change works are always far different than human beings expect because nature is complex and people are not gods, all-wise and knowing. Scientific discovery is a slow trial and error process with most often produces results that disprove rather than proves a theory. Numerous years of testing and experimentation is needed to yield prove scientific facts that are valid, reliable and usable. For example scientist have been working trying to find the workable details of the known concept of nuclear fusion for almost 70 years but still are not able to achieve self-sustaining fusion process as energy source which would be a profound limitless energy source if self-sustaining fusion could be achieved. Scientist just do not know all the details of how to make this happen and must continue likely for decades to make slow progress. Nature is complex and is only discovered and known by very hard trial and error testing of theories. No human being even Einstein has a ready grasp of complex natural phenomena such as climate change. What climate process is all about can only be known by years of trial and error experimentation until all the numerous detailed process of climate change are discovered. This has not happened; We only have scientific opinion which is not reliable scientific knowledge or facts. By the way the continuous testing and proving Einstein's theory of relativity has gone on for over a hundred years and will continue to go on. Once again nature is very complex and new complexities of nature are always being discovered by further testing of proven theories. For example unknown matter called dark matter and unknown forces called dark energy have been discovered which are not explained in theory of relativity yet they appear to be the major form of matter and energy in the universe. The constant testing of Einstein theory showed these major forms of matter and energy are not accounted for by any theory. Science is in no danger of running out of new discoveries showing just how extremely complex nature is. Galileo discoveries of the planets which was highly disputed by the Church were not even a minor fractional part of the total complexity of the universe now known 400 years later. And there is no end to discoveries that will be made completely reshaping science -- what is known -- in the future. Your concept seems to be that skepticism which is highly valued and encouraged in science in testing established theories is somehow disruptive or destructive when in fact skepticism of existing theory is essential for continuous further discovery of the complexity of nature and a normal mainstream part of science. Nature is infinitely complex beyond any human pretense of understanding. Our understanding of nature will always be partial and will never be complete. Tom - not all scientific knowledge is obtained via rigorous testing and experimentation. There is a vast class of scientific knowledge that is obtained purely through observation and analysis. Some of prominent examples is the Big Bang Theory, the age of the universe, the existence of black holes, of dark matter, of dark energy, of other potential habitable planets out there… None of them can be proved via rigorous testing and experimentation. All of these discoveries are derived via meticulous data collection and analysis. The same thing can be said about climate change. We try to understand climate change, its cause and impact through more and more sophisticated data collection and analysis. “Nature is infinitely complex beyond any human pretense of understanding. Our understanding of nature will always be partial and will never be complete” – Does it mean that we have to wait until we have a complete knowledge before we can do anything? Or should we continue to explore and discover and leverage this knowledge to our best benefit? It reminds me of the Heisenberg's Uncertainty Principle. Even with uncertainty, we can still find the way to use it with Quantum mechanics. Finally, the world with live with are extremely probabilistic oriented. As an example, the use of medical science is mostly about probability. When you take a drug or undergo an operation, do you know that the medical community does not guarantee that it will cure you? They can only state that there is a probability of X% that the drug or operation will cure you. If you are sick or dying, a promise of 60% or even 50% chance of being cured, are you going to take it? The same thing can said about climate change. The consensus of the scientific community today is that there is a very high probability that it is caused by human activities, that it is accelerated and underestimated, that it will cause very negative effect to human society. Until we have better knowledge, this is the best we have now and it is morally and intellectually imperative that we should work together to come up with reasonable solutions. Even the Defense Department are developing War Games based on potential conflicts broken out due to severe climate change that can cause mass starvation, mass migration, mass unrest, etc. Overall, risk assessment and risk mitigation is a good insurance policy. Do you remember the Parable of 5 foolish and 5 wise wedding maids in the Bible? Should the 5 foolish maids know with absolute certainty about the arrival time of the bridegroom before they should bring extra lamp oil? Are you kidding? Drugs and chemicals of any type are rigorously tested to prevent mass toxicity. Guessing whether a drug or chemical will have mass adverse reactions or deadly effect is not acceptable. When drug and chemical testing was not performed, massive deadly effects on the public occurred. For example the drug Thalidomide long after its release to the public in the 1950s caused massive birth defects in multiple generation of daughters whose mother took the drug decades before. Agent orange (dioxin) was release and extensively used in the 1960s by the military in Viet Nam to clear jungle vegetation. The chemical was found to be an extremely deadly toxin that killed anyone who came in contact with it. In the 1970s asbestos which had been used extensively for decades proved to be very cancerous. History is loaded with examples of untested deadly chemicals and drugs that cause mass injury for decades. Science is all about testing, testing and more testing. And even then not every effect will be readily discovered. You can not develop statistics until you have first done extensive testing. Statistics are meaningless without testing. In the case of climate change which mostly can not be tested effectively the so called statistics are not reliable and are just arbitrary extrapolations of past weather data which worldwide has been gathered for less than 100 years. However it has been known the world since the last ice age 11,000 years ago has been warming due to natural and not man-made causes. Even then for reasons not understood there have been several mini ice ages lasting for hundreds of years. Greenland use to be inhabited for hundreds of years until it became uninhabited due to extreme cold climate change during the last millennium. Statistics do not tell why Greenland climate became drastically colder 500 years ago. Since there is no way to test a climate system all our data is very meager, very recent (less than 100 years) and highly unreliable. Scientific opinions on climate change are highly speculative and unreliable guesses based on untested assumptions. Tom - this is my last attempt to address your distorted arguments: 1. The result of any medical treatment is always probabilistic. Please go and talk to the medical professional so they can explain it to you. Your argument about rigorous drug testing has no relevance to this fact. Even the most thoroughly tested drug may not help some group of people. 2. Science is all about testing. I completely agree. But there are 2 kinds of testing: one is lab based testing where you can do actual experimentation, the other ones is based on model construction and using data collection to analyze and test the validity of the model. The best example of the latter type of scientific discoveries is in the field of astronomy. Climate science also belongs to this area. Sophisticated climate models are defined, revised, and validated against rigorous data collection and analysis and this will continue indefinitely. With the help with recent advances in the following technical fields such as big data, parallel computing, Internet of Things where massive amount of sensors can be deployed, these climate models are getting more and more accurate. Your statement that “Scientific opinions on climate change are highly speculative and unreliable guesses based on untested assumptions” is completely false and a blatant lie. It basically accuses that the Pope and the Vatican scientists rely on these so called “opinions and guesses” for this encyclical. 3. Your last argument about events that happened thousands of year ago remind of the incident I had when I mentioned about Big Band and the age of the universe to a relative. She replied with this question – “How can they (scientists) know this? They were not around 13 billion years ago, weren’t they?” The only reason I bother to discuss with you and your conservative friends is that you guys are using such bogus, falsified, and pseudoscientific arguments to attack our (my) Holy Father and I refuse to be quiet. Having now read through Laudato Si in full, I vote with Mr. Schneider in seeing it as hopeful. It is in the end consistent with the line of Catholic Social Teaching, elaborating on it in the sphere of ecology but touching on its many themes such as materialism and abortion. Does CST oppose aspects of a modern "consensus" world view? Of course it does, as any thinking rooted in Scripture must. Pope Francis is hopeful, but also seems a man on a mission as he has much to do and sees him time remaining here as short. I do agree that, however, that Mr. Schneider is a bit harsh in referring to some of the conservative commentators. I find commentary by people like Douthat , Dreher and Gobry to be helpful and interesting as I think they are genuinely dealing with the material. You need to divide the commentary from the right into three buckets - (1) those that are ultimately indifferent or even hostile to CST and the views of the church; (2) those that profess alignment, but have for too long emphasized some of the tradition (that which comfortably aligned with their political position) and intentionally ignored the rest; and (3) those that are trying to wrestle with Laudato Si. We should be careful not to lump all such commentators into buckets 1 and 2. It would be a disaster if Laudato Si if simply labeled as "of the left" and dismissed by others. Francis writes as a mystic with realistic keyboard, in touch with what is and with what is to come, one and the same, yet more, the fruit of prayer, study and scientific contributions from some of the best, for some hard to swallow due to its unknown content and predetermined disagreeable scent noses held tight. But how enlightening once ingested and assimilated, objectively, that is!